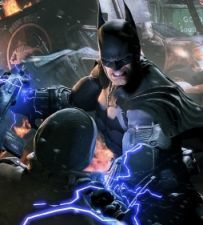 This October will see a prequel to the highly revered “Batman: Arkham” games in the form of Batman: Arkham Origins. The game being a prequel, with a new developer and a different voice cast, many fans have expressed disinterest in the title, but everything we’ve seen about it, including a first hand look at E3, leads us to believe it could be just as great. 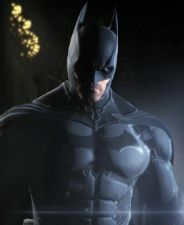 Though Kevin Conroy portrayed the Dark Knight in the previous installments, the developers wanted a new voice actor to come aboard to lend a new style to this “year two” Batman. 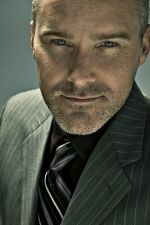 Enter Roger Craig Smith, who has made a career of doing video game voices and is most well known for providing the voice of Ezio in Assassin’s Creed II, Chris Redfield in the Resident Evil series and the titular blue hedgehog in Sonic the Hedgehog. We spoke with Roger about working as the caped crusader and everything that went into his getting the part and his process. Check it out below! When were you first approached about the project? As far as the time frame, it was well over a year ago. I think it was the beginning of summer last year. The boring answer is that I got a call for an audition, basically went in and did an audition. At the time I can’t really remember if I knew what it was I was auditioning for. They sometimes try to keep you in the dark about some of that stuff, just to keep the project under wraps. Then I ended up getting a call back audition after that and at that point I kind of knew what the project was for and sort of what was at stake. Do you remember your initial thought process before and after you accepted it? So I think my thought process was just to do the best audition I could and not think too much about “Holy cow this is for Batman.” But I do know once I got the call and had landed the role, both Troy (Baker) and I have said, “You book it and go, This is awesome but whoa holy cow, I can’t believe I got this role now. These are massive shoes to fill as far as portraying such an iconic and beloved character. I need to make sure that I’m going to do the absolute best job that I can.” And with that comes the pressure of wanting to deliver a top notch performance and to make everyone on the production side of things happy and hopefully the fans will be happy with what you deliver as well. It’s sort of a mixed bag of emotions were you’re excited to have this opportunity, but with that opportunity comes the pressure of making sure that you deliver something that’s going to be received well. So would you say the pressure you felt from the fans and the community was more severe when you got the job, when the trailer came out, or when you were at E3 doing interviews? I guess at almost all points you do everything you can to not necessarily think too much about that. My job at every point along the way is to make certain that the voice director is happy with what I’m doing, to make certain the creative director is happy with what they are seeing, make sure the writers are happy. You try to make the people on the production side as happy as possible because it’s their baby. I’m a hired gun, I come in and bark in front of a microphone for a few hours and hopefully I’ve delivered what it is they want to get from that character. I don’t want to think about whether or not fans are going to like it or how the outside world was going to respond to it, because then I’m not thinking about the job that’s right in front of me and I’m not thinking about the task at hand and I’m certainly not going to be able to really concentrate on just doing the work. So I have to focus on the work and at the end of the day I really don’t know the overall tone and approach that a lot of these developers want to take with their characters or project and I don’t want to have to worry too much about that stuff. I try to keep things as simple as possible and entertain the folks on the other side of the glass and make sure they enjoy the performance. If they tell me it’s not what they’re looking for, then we go in different directions and try to finesse things in a different way. It really only kind of starts to hit home when the trailers do start coming out, like anybody I’m going to look at comments and we what people are saying because I want to see. “Oh it looks like they don’t like what I’m doing. Oh hey, cool, they understand what WB Montreal is going with this.” So you start to see the feedback, but even then it’s meant to be experienced from the moment you put the disc in and hit start. That’s the most important opinion at that point, how did they receive the game in its entirety? Trailers are meant to get you all excited, and they do a great job at doing that, but that’s not the project in its entirety. So you want to see what the response is after people experience this story that so many people have put so much hard work into because they want you to experience it in that fashion. Was this a role you ever thought about playing? Again, you’re just happy to have a job and happy to work and want to go in and do the best job you can. It’s a very fun and surreal kind of thing to be experiencing because you’re getting to portray a character that millions of people the whole world over love. With great honor comes great fear I guess, because I can’t believe that let me do this and I’m like I hope people don’t dislike what I’ve done with this. We’re all working really hard to make sure that people love the end result. Did you have a certain style or approach that you used for the character? Maybe something that we haven’t seen in the cartoons or games or movies? Oh, that’s going to be great. I’m usually not very involved in the overall major picture, I tend to just go in and lean very heavily on the director and let the writers and producers say, “What is it we’re trying to do with this character?” So there’s no pre-planned performance on my part, as much as it is we go in and throw a couple of things on the wall and just see if they stick and we start finessing the performance for there. We worked very heavily on what they refer to as the “voice print” of this character in the beginning stages, because we were trying to finesse a performance that pays homage to previous iterations of the character that everybody is familiar with but also taking it from a newer perspective of saying “this is a prequel.” So this is a different time in Batman’s career than what we’ve done in the past or explored in these other games and with that you’ve got the Christian Bale performance that influences the way people perceive Batman as this time, and the Kevin Conroy from the animated series and the previous Arkham games, we’ve got to finesse things. As Troy Baker put it at Comic-Con, there was a point on the horizon that we knew we had to kind of keep in mind as far as our performances, because after all this is a prequel and we wanted it to be believable that these versions of these characters can become those versions of those characters that we’ve come to know. That being said, we’re not trying to do an impression or an impersonation, we’re doing a different time in those characters’ lives and with that in mind everybody has a lot of influence on how we want this character to sound. I’ve said it a million times, but this is Troy’s game in so many ways just because that character, The Joker, is so difficult to do and do well and do it with all those subtly nuances. Chilling evil with comedy and silliness and unhinged deranged well, and to do that and do it believably with a character that’s already so unbelievable. It’s incredible, he does such an awesome job with the character. I’m super excited just to play the finished game and go through and experience his performance in a way that I only got to see him raining it down. It’s going to be a lot of fun to see the finished product with that. Speaking of Kevin Conroy, you’ve taken on a role he has done quite famously. Did you ever talk to him about it or maybe look at what he did to get some ideas? So there’s not a lot of pre-planning that I go through. I want to show up, be ready to work vocally, and health-wise make sure I’m healthy and ready to do the performance. I don’t go in thinking too much about what’s been done. Obviously you’ve got to know that you can’t go so far off the path that you go against the character and that’s usually why I lean so heavily on the director and the creators in the room because they know what they want to capture as far as the character goes. Even I’ll get a chance to speak up every now and then if I feel there’s a certain line of dialogue if I feel “this doesn’t sound like Batman.” It usually always comes down to character more than any previous or prior performance, and I’m not a good impressionist anyway therefore I don’t want to approach it like that. I tend to want to do whatever I can with that version of the character that they’re saying they want to capture. So you approach it from a fresh perspective just about every single time, that’s my approach. You voice Captain America on the Avengers Assemble cartoon series, did you ever think you were stepping into enemy territory when you took this on? [Laughs] No, not at all. I’m always baffled by the Marvel vs. DC fanbase. It’s like if you ask somebody “Do you like baseball?” and they say “I love baseball but I hate this team and I hate that team and I only love this team!” Then you’re not truly a fan. We can all be fans of characters and not necessarily companies and these are all great stories and they’re all done by great creative people who want nothing more than to have a blast and entertain the masses. So, no, if anything I don’t even bother going there because it was just be the most silly thing. Really just from a work perspective I don’t get hired by Marvel, I get hired by a production company and my job is to be a voice actor, it’s to portray characters. At the end of the day that’s what I love, I love portraying characters. I don’t to go in and say “Oh no, I’ll be doing no Marvel work” or “No! No DC work,” that’s not the way it goes but it is kind of funny. It’s one of those issues where I have to be very careful about if I’m at a convention, especially if I’m there on behalf of a particular company I have to remember which projects to promote. In that regard it’s a little bit of a tap dance on my part, but I don’t feel I’m moonlighting or doing anything wrong. So were you ever up for another role or was it just Batman? Without any context, can you give us your favorite line from the game? I know everything’s wrapped up in secrecy. Yeah, everything’s so secret as it is, and I’m trying to think if there’s any…One of the nice things I liked, and thankfully it’s in one of the trailers so there’s no spoiler alert, but to me it’s playing upon the obsessive nature of Batman at this time in his life. He’s on top of the tower and he’s got the guy by his foot and he drops him onto the Christmas tree, and he uses that guy’s cell phone to pinpoint an area of interest and Batman delivers a “There you are.” It’s so kind of chilling the way they animated that sequence and it’s kind of like he’s gleeful that he’s on the hunt for these guys. That’s some of the more fun because it’s a little more unhinged, he gets a kick out of this stuff element that I really enjoyed getting to explore. I have to be very careful with lines. I’ve yet to see the finished version of it, but there’s a scene that takes place, and again I don’t even know if I can say what character that I’m acting with, but it was a lot of fun and sort of a poignant coming of age moment for Batman. I’m really looking forward to seeing the finished product, but if it hasn’t come out I cannot divulge further information on that scene! 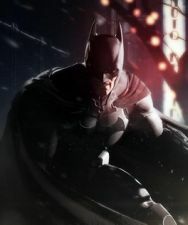 Are there any plans for you to return as Batman in another game? Oh god, I would have no idea, and even if I did I wouldn’t be able to say it. I would have no idea. We’d be so far off from that right now, because everyone’s working to get this to be the best it can be for October 25th that I have no idea what’s in the works. Again, I don’t want to think about that stuff. There’s so many people that are so heavily involved in the decision-making process in these things and sometimes that doesn’t have anything to do with you as a person or an actor, sometimes they just want to go in a different direction, maybe an even younger Batman. Who knows where they’re going to take all of these storylines. That being said, I’m usually the last person to find out. If I ever get another opportunity to portray Batman it’s going to be the icing on the cake on top of the icing on the cake, for the fact that I even got to do it even once. I’m more than happy with this one opportunity and it’s already just too surreal to wrap my brain around, until it comes out then we’ll see how it’s landed that time. I’m very excited. Batman: Arkham Origins will be available for the Wii U, PlayStation 3, Xbox 360, and PC on October 25, 2013.